To combat the federal government’s secrecy, Wikileaks founder Julian Assange is offering thousands of dollars to anyone who will turn over the missing documents deemed “too dangerous” for the American people to see. This sudden change in policy was announced on Thursday, as the government proved that it will not follow the rules it created for itself with the President John F. Kennedy Assassination Records Collection Act in 1992. Caving to lobbying pressure by intelligence agencies, Trump announced he would not order the release of the full tranche of records, instead following last-minute recommendations of his national security agencies that some of those records be redacted, White House officials said. During a call with reporters, White House officials explained that while some 2,800 JFK records will be released today, the publications of the remaining records has been postponed for 180 days to give agencies more time to figure out what they want redacted, reports ZeroHedge. Just like that, the long-awaited and expected day came and went, and certain files related to the assassination of Kennedy were deemed too sensitive to release, even though it has been almost 54 years since he was killed in Dallas, Texas. Although federal law demanded all files pertaining to his assassination be released to the American people on Oct. 26, few will ever know what the government wants to keep secret. 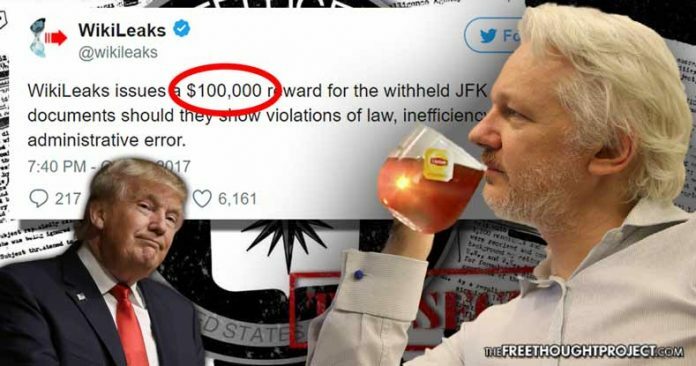 However, WikiLeaks is firing back and is offering a reward of $100,000 to anyone who can produce the missing documents, with certain stipulations attached. Wikileaks does not want information that is irrelevant, but documents that show the government was criminal, inefficient or administratively negligent in complying with its own 25-year-old federal law. It remains to be seen if there will be any takers of Assange’s offer to enrich the life of a leaker, but the money is out there nonetheless and may be limitless depending on how many documents there are to be handed over to the world’s most notorious whistleblower organization. Assange implied Kennedy was killed by the CIA—a theory long held by many—when he tweeted JFK’s own comments regarding the spy agency, which is literally accountable to no one but themselves. “I will splinter the CIA into a thousand pieces and scatter it into the winds,” Kennedy said. The president was committed to getting rid of the clandestine organization, which has been responsible for overthrowing a number of foreign leaders, and establishing the current U.S. foreign policy that seems to be involved in a never-ending cycle of war. 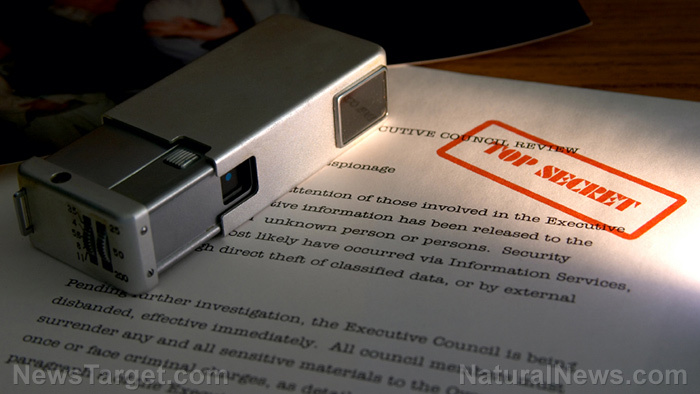 The answer to the question of what could possibly be so important to national security that the federal government would break its own laws, may never be revealed. It is obvious to anyone who can look objectively at the release that the government has no intention of releasing all of the documents. For loyalists, those committed to believing the official government’s narrative at all costs, any document the government is withholding is impertinent to the facts in the case. “Oswald did it. My government told me that when I was in grade school, and that’s all I need to know,” might be the self-talk that runs through their minds. To the rest of us, it is proof our government’s laws apply to everyone but themselves. Not only will they hide documents from their own people for 54 years, but even when they promise they will come clean and let go of all they have been holding onto, they lie and find a way to get out of it for “national security” purposes. It remains to be seen whether someone within the government will set the record straight by releasing the documents to Wikileaks and finally letting the American people see the complete picture of what happened on that November day in 1963.